In light of past security breeches and terrorism threats, the United States Transportation Security Administration (TSA) has implemented a number of changes that will affect the way travelers travel by air. Several new security measures have been implemented in the airport passenger screening process in recent weeks – some of which have caused quite a stir among would-be airline passengers. Travelers should expect to undergo enhanced scrutiny by airport security and to be subjected to different types of scans from electronic detectors searching for contraband when boarding their next flight. While some travelers might object to the increased searches, the TSA maintains these measures are necessary to ensure the safety of passengers. The good news is there are several things that passengers can do to speed up the screening process and make the searches move more smoothly, which benefits all passengers in the long run. Here are a few tips, courtesy of the TSA, to keep in mind when planning your next flight. Metal items are certain to set off the metal detector’s alarm every time – regardless of their threat level. A metal object as simple as the button on your jeans can send a false alarm to airport screeners, resulting in a more thorough, time consuming inspection. You can avoid this by not wearing metal objects when you pass through airport security. Remove all unneeded metal objects, such as change and keys, from your pockets ahead of time and place them in the bins provided. The fewer layers of clothing you wear through airport security check points, the fewer layers there will be for airport screeners to scrutinize. Heavy coats and jackets must be removed before proceeding through the security point anyway so its best to pack them in your carry-on bag. 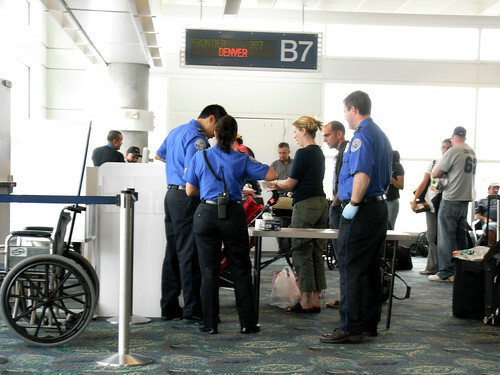 If you have a pacemaker, prosthetic limb or any other medical condition that may issue a false alarm for airport security personnel on the detection devices, be sure that you tell them before moving through the checkpoint. Additionally, if you are in need of any assistance to move through the screening point, alert security personnel to ensure your experience goes smoothly. One of the most common reasons airport security lines move slowly is people fumbling to find plane tickets, boarding passes, passports and other identifying documents. Flight regulations clearly state that you’re going to have to show these items so it’s best to have them in your hand before you enter the security checkpoint line. This way, you aren’t left sifting through the contents of your luggage to find them at the last minute. During the holiday season, travelers will often have gifts they are bringing to loved ones. If you are planning to travel with any gifts, be sure that they are packed away in your luggage and unwrapped. During airport security checks, wrapped gifts are often opened so that screeners may inspect the contents. You can save yourself the grief of re-wrapping and the time invested in searching the sealed package if you wait until you arrive at your destination to add the finishing touches to your gifts. Are Full Body Scanners the Right Solution? Baba Pandey loves traveling, trekking and adventures. He is currently involved with Nepal Trekking. Baba is from Nepal, home of the Everest Base Camp Trek. I agree with all of these.Recently, i’m having conflicts with airport security, thanks for these guidelines.